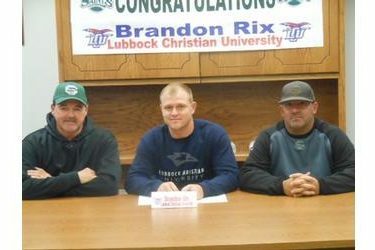 Seward third baseman Brandon Rix signs to play baseball at Lubbock Christian. The redshirt sophomore from Canon City, Colorado signed in the All American Room Monday afternoon. After sitting out the spring of 2013 with an injury, Rix came on strong expecially at the end of last season. He hit .266 with two homers, eight doubles, and 26 RBI’s. His interview will air during the Sportsguys Tuesday morning between 7:37 and 9 on 1270 and kscbnews.net.